RIO DE JANEIRO (AP) — A few months before U.S. table tennis player Tahl Leibovitz left his home in Queens, N.Y., for the Rio Paralympic Games, his wife, Dawn, heard a bang late at night. They didn't identify the source of the noise until their neighbor told them her air conditioner had fallen onto their car. The neighbor was low on money but wanted to pay for the damage eventually. Leibovitz refused the offer. "He understands what it's like to be in a dark place," his wife said. Amid a childhood scarred by an uneasy relationship with his father and long periods of homelessness, Leibovitz found table tennis. A three-time Paralympic medalist, the 41-year-old competed in his fifth games in Rio, losing in the quarterfinals. He said he hopes to continue playing another eight years, pointing toward a possible Los Angeles 2024 Games. 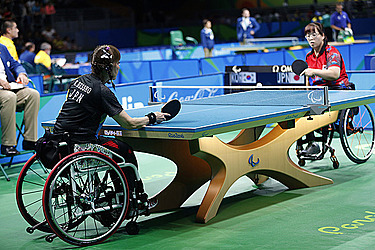 "I would define my self-value and self-esteem," he said, "through winning and through playing table tennis." He often competes in able-bodied tournaments but meets the classification standards for the Paralympics because he has osteochondroma, which causes benign bone tumors that can limit movement. Previously a substance abuse counselor, Leibovitz works at New York Families for Autistic Children. "I tell my patients that although they believe they are not OK, in reality they are actually OK," he said. "Their circumstances may not be." When Leibovitz was a young teenager, he broke a basement window at his house. Tensions over that incident with his father began an eight-year period of on and off homelessness, he said. In addition to staying away from home, he stayed away from school. Sixth grade was the last year he completed. The Boys & Girls Club in Queens opened at 3 p.m. on weekdays. There, he could play table tennis until the club closed around 9 p.m. He slept on subway trains at night. "I don't know if (returning home) was really an option for me at that time," Leibovitz said. He and his twin sister, Maja, said their father, Ernest, physically abused them. His father, when reached for this story, said he did not consider his treatment of his children abuse. "I wasn't hitting him because I was getting mad and upset. I was hitting him because I was trying to make a point," Leibovitz's father said, adding that his son was a "problematic teenager." His mother, who was divorced from his father, died in 2006. His father said he wasn't aware of his son's perpetual homelessness. His son told him he was living with friends. Leibovitz and his father now see each other about once a month, they both said, living just over a mile apart. "He feels bad about me being homeless for that many years, but he said it made me very tough and who I am," Leibovitz said. Leibovitz played in his first table tennis tournament at the Junior Olympic trials when he was 15. At a tournament in New Jersey in 1995, an international referee told him he might classify for Paralympic sport because of his condition. The next year, Leibovitz won gold and bronze at the Atlanta Paralympics while still homeless. Soon after, he moved in with his twin sister. Leibovitz, who also won bronze at the 2004 Games, is self-coached. Angie Bengtsson, the U.S. table tennis head coach in Rio, said they communicate over the phone to discuss his training. At training camps and tournaments, Bengtsson said Leibovitz helps younger players. "They have a lot of respect for him," Bengtsson said. "A lot of them want to be just like him." In addition to his athletic success, Leibovitz earned his GED and said he has bachelor's and master's degrees from Queens College and a second master's in social work from NYU. Pieces of his past show in his outlook on his sport. "Whether I win or lose, I'm OK," Leibovitz said. "I'm not going to say it doesn't matter, but it doesn't change who I am." In 2002, Leibovitz used an inheritance from his grandfather to buy a three-bedroom condo, which he said is too big. It's a problem, he said, he never thought he would have. "I'm sure there's a lot of it that he wishes he didn't have to go through," his wife said. "Even though it was all bad that happened, it will be applied to his life to help others. That's what he's doing with it now."